Barbara Stanga and I (Judy Duthu) are co-owners of the winningest Netherland Dwarfs in the state of Louisiana. STANGADU DWARFS won the top honors (highest points)in the Louisiana State Sweepstakes in 1999 and 2001. 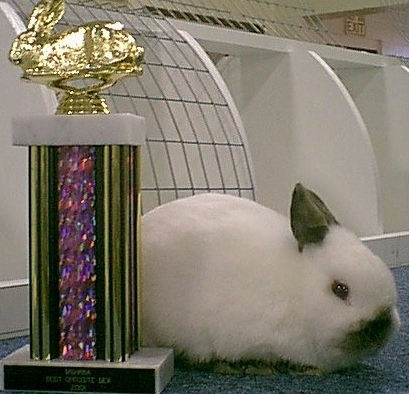 We are members and Charter Breeders of the American Netherland Dwarf Rabbit Club. 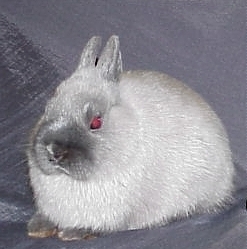 Although we do raise other colors, we specialize in Siamese Sable, Siamese Smoke Pearl, and Himalayan. StangaDu's Butterfly Kisses did a LOT of winning for us this past show season. This little Siamese Smoke Pearl doe won her first Best of Breed at 12 weeks of age! She made Grand Champion very quickly! StangaDu's Nutcracker is an important herd buck in our breeding program. He has more than 20 legs of championship and there is usually a winner in every litter he sires! You are welcome to view more photos of StangaDu Netherland Dwarfs. Barb and I usually have quality Netherland Dwarfs for sale at the shows we attend. WANT TO SEE MORE ABOUT OUR NETHERLAND DWARFS? CLICK ON THE BUNNY BELOW!